Chipotle is adding bacon to the menu at eight California restaurants in September ahead of a possible national rollout. Baconoholics, there's a new reason to consider Chipotle Mexican Grill for your lunchtime rotation: the restaurant chain is looking to cook up a bacon-fortified menu. After testing Applewood Smoked Bacon in a trial run at the chain's test location in New York City, Chipotle is adding bacon to the menu at eight restaurants next month in Orange County, California – in advance of a possible full market deployment. Customers at the test restaurants will be able to add bacon to burritos, tacos, food bowls and salads. At The Bluffs location in Newport Beach, California, customers can also order a BLT quesadilla. "Consumers have always said 'everything tastes better with bacon' and that is exactly what we confirmed in our New York test kitchen," Chris Brandt, Chipotle's chief marketing officer, said in a statement. "We found consumers added bacon to their traditional bowls, burritos, tacos and nachos while also enjoying new items such as the BLT quesadilla with bacon, lettuce, tomato and cheese grilled to perfection." 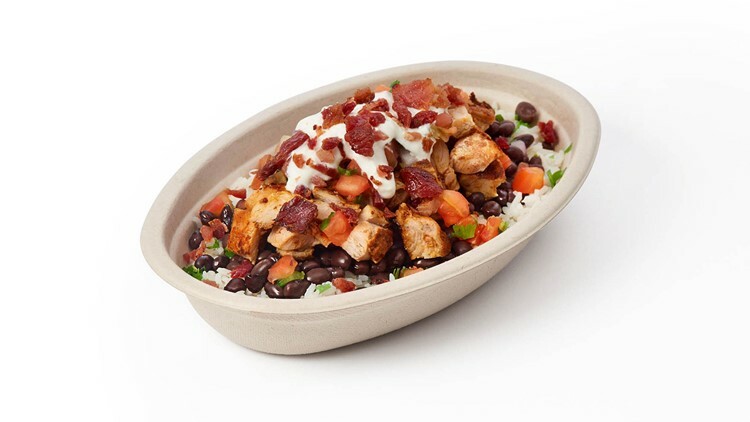 Chipotle is testing a new Bacon Bowl this September as part of an eight-restaurant test in Orange County, Calif. before being considered for a full market test. That menu item is among experimental offerings available at Chipotle's Next test location along with avocado tostadas, nachos and Mexican chocolate shakes. Nachos will also be coming to more of Chipotle's restaurants. The dish, topped with a new queso and a choice of meat, beans, salsas and lettuce, will arrive in all Denver and Minneapolis-St. Paul restaurants in October. And in an ongoing deal: some restaurants in Dallas and Miami will be staying open later until 11 p.m. and customers can get $2 tacos with the purchase of any drink after 8 p.m. through Sept. 30. In select Indianapolis and Philadelphia restaurants, Chipotle customers can add regular-sized chips and a fountain drink to their entrée order for just $3.